Small group Bible study will never be the same! With ZondervanGroupware Small Group Editions, leaders have interactive DVDs that feature bestselling authors Philip Yancey and John Ortberg to teach a small group Bible study in their own homes. The DVD and 32-page leader's guide provides ease of facilitation for the small group leader. The participant's guide, available separately, provides a book for small group members to follow along with the teaching and record responses to questions.What's So Amazing About Grace?--Over 1 million books sold In this ten-session small group DVD, award-winning author Philip Yancey offers intimate glimpses of God's life-changing grace. Using candid interviews with real people, he illustrates the power of God to forgive the most horrible deeds, love the unloving, and redeem the seemingly irredeemable. - Publisher :Small group Bible study will never be the same! With ZondervanGroupware Small Group Editions, leaders have interactive DVDs that feature bestselling authors Philip Yancey and John Ortberg to teach a small group Bible study in their own homes. The DVD and 32-page leader's guide provides ease of facilitation for the small group leader. The participant's guide, available separately, provides a book for small group members to follow along with the teaching and record responses to questions. What's So Amazing About Grace?---Over 1 million books sold. In this ten-session small group DVD, award-winning author Philip Yancey offers intimate glimpses of God's life-changing grace. Using candid interviews with real people, he illustrates the power of God to forgive the most horrible deeds, love the unloving, and redeem the seemingly irredeemable. 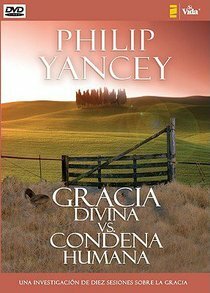 About "Gracia Divina Vs. Condena Humana (What's So Amazing About Grace?)" :Small group Bible study will never be the same! With ZondervanGroupware Small Group Editions, leaders have interactive DVDs that feature bestselling authors Philip Yancey and John Ortberg to teach a small group Bible study in their own homes. The DVD and 32-page leader's guide provides ease of facilitation for the small group leader. The participant's guide, available separately, provides a book for small group members to follow along with the teaching and record responses to questions. What's So Amazing About Grace?---Over 1 million books sold. In this ten-session small group DVD, award-winning author Philip Yancey offers intimate glimpses of God's life-changing grace. Using candid interviews with real people, he illustrates the power of God to forgive the most horrible deeds, love the unloving, and redeem the seemingly irredeemable. Ever since Yancey has explored the most basic questions and deepest mysteries of the Christian faith, taking millions of readers with him. Early on he crafted best-selling books such as Disappointment with God and Where is God When it Hurts? while also editing The Student Bible. He co-authored three books with the renowned surgeon Dr. Paul Brand. 'No one has influenced me more' he says. 'We had quite a trade: I gave words to his faith, and in the process he gave faith to my words.' More recently, he has felt the freedom to explore central issues of the Christian faith, penning award-winning titles such as The Jesus I Never Knew, What's So Amazing About Grace? and Prayer: Does It Make Any Difference? His books have garnered 13 Gold Medallion Awards from Christian publishers and booksellers. He currently has more than 15 million books in print, published in 35 languages worldwide. 'I write books for myself,' he says. 'I'm a pilgrim, recovering from a bad church upbringing, searching for a faith that makes its followers larger and not smaller. I feel overwhelming gratitude that I can make a living writing about the questions that most interest me. My books are a process of exploration and investigation of things I wonder about and worry about.' Yancey writes with an eye for detail, irony, and honest skepticism. So, just how does a man who's been through all Yancey has, draw close to the God he once feared? He spends about an hour each morning reading spiritually nourishing books, meditating, and praying. This morning time, he says, helps him 'align' himself with God for the day. 'I tend to go back to the Bible as a model, because I don't know a more honest book,' Yancey explains. 'I can't think of any argument against God that isn't already included in the Bible. To those who struggle with my books, I reply, 'Then maybe you shouldn't be reading them. Yet some people do need the kinds of books I write. They've been burned by the church or they're upset about certain aspects of Christianity. I understand that feeling of disappointment, even betrayal. I feel called to speak to those living in the borderlands of faith.' He lives with his wife in Colorado.